Dustin Schlangen, PT, DPT, CSCS, CMTPT, received his Doctor of Physical Therapy (DPT) degree from the University of Minnesota. Although a native of Minnesota, Dustin began his career practicing in the Washington, DC area but has since returned home and settled in the Twin Cities. Dustin has experience treating individuals with a variety of orthopedic injuries, including both surgical and non-surgical, and ranging from acute to chronic conditions. 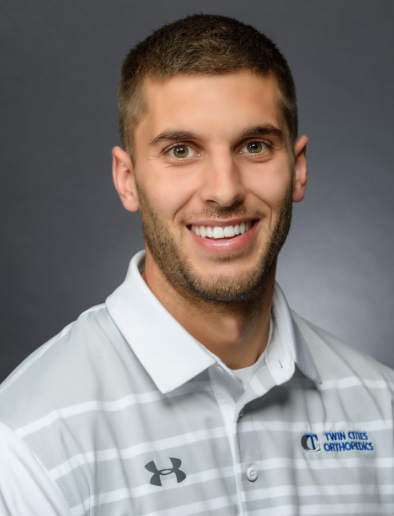 He has a particular interest in sports medicine and has worked with recreational, high school and collegiate athletes in their return to sport and performance enhancement. Dustin is a manual trigger point therapist and is certified in dry needling, which he believes can be an effective adjunctive treatment for a variety of conditions. Outside of work, Dustin enjoys spending time with his family and friends, and he has a particular passion for the outdoors. He stays active by hiking, running, playing recreational sports and staying involved in local community races and events.